With a history going back to 1816, The Willard Intercontinental Hotel, at the corner of 15th and Pennsylvania Avenue, NW, is one of the Nation’s Capital’s most storied buildings. The Hotel has added over 10 historic plaques to memorialize activities that took place at the Hotel. 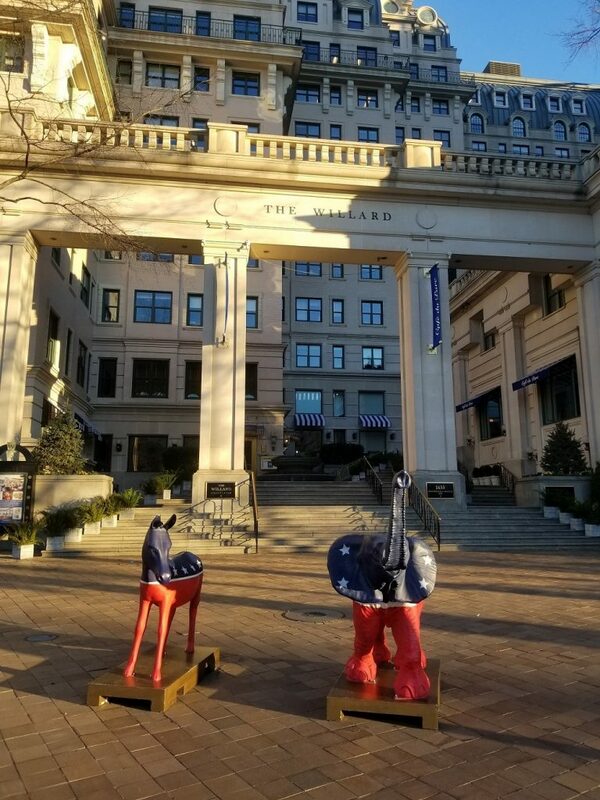 With a history going back to 1816, The Willard Intercontinental Hotel, at the corner of 15th and Pennsylvania Avenue, NW, is one of the Nation’s Capital’s most storied buildings. The original hotel was housed in a row-house built by Captain John Tayloe and leased to Joshua Tennyson as a hotel. In 1830, Henry Willard is hired to run the hotel. 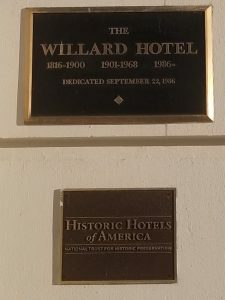 In 1847 the hotel is renovated and renamed the Willard City Hotel. 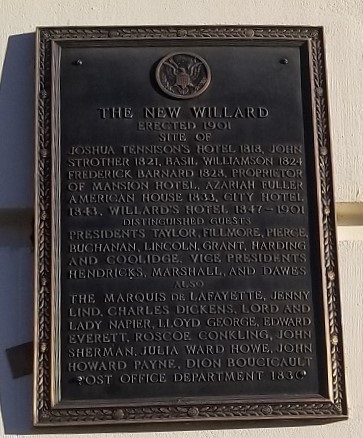 During the next 120 years the Willard welcomes many U.S. Presidents, including Lincoln who stayed there before being inaugurated in 1861 and moving to the Executive Mansion, and international delegations. Other guests include Martin Luther King, Jr. and the Dalai Lama. In 1901 the building is torn down and rebuilt in the current Beaux-Arts style. However, the hotel closes in 1968 after declining revenue and the threat of tear-down by the Pennsylvania Avenue redevelopment plan. After ten years it is decided that the Willard should not be torn down, and in 1977 the hotel is earmarked for preservation status. The newly renovated Willard reopened in 1986. 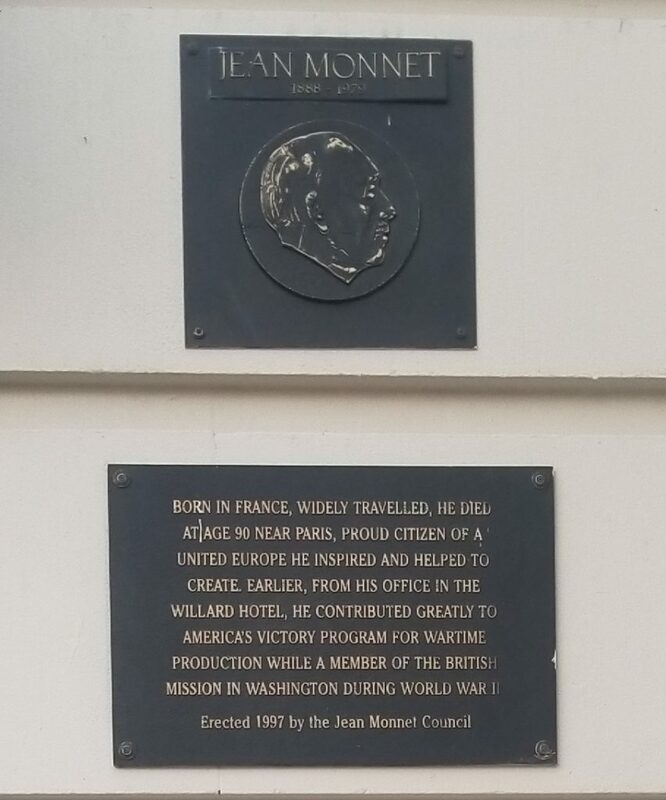 Outside the main entrance of the Willard Intercontinental Hotel are several plaques. presented by the Ladies of the Grand Army of the Republic January 24, 1930. 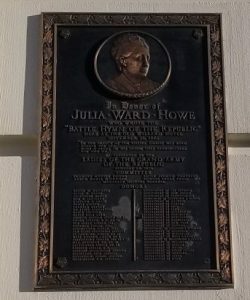 Plaque memorializing the New Willard, Erected 1901. 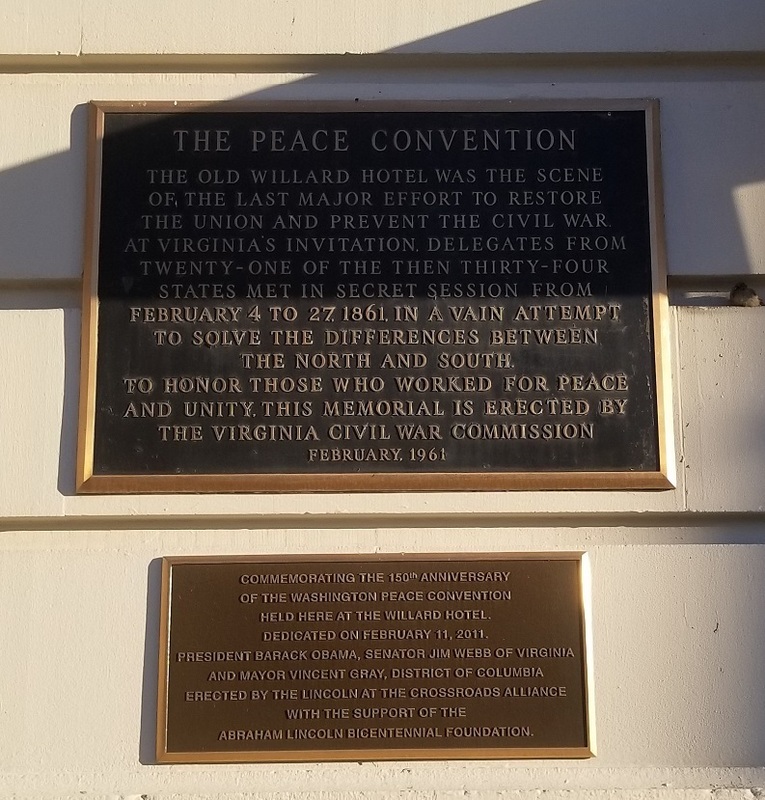 The old Willard Hotel was the scene of the last major effort to restore the Union and prevent the Civil War at Virginia’s invitation. Delegates from twenty-one of the the then thirty-four states met in secret session from February 4 – 27, 1861. In a vain attempt to solve the differences between the north and the south. To honor those who worked for peace and unity. This memorial is erected by the Virginia Civil War Commission. February, 1961. 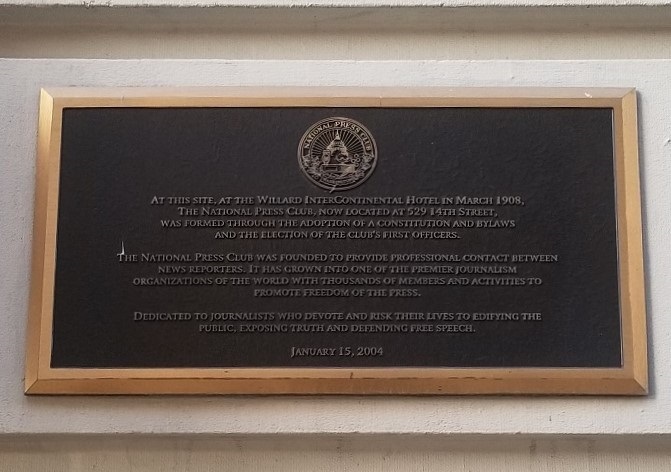 At this site, at the Willard Intercontinental Hotel in March 1908, The National Press Club, now located at 529 14th Street, was formed through the adoption of a Constitution and bylaws and the election of the Club’s first officers. The National Press Club was founded to provide professional contact between news reporters. It has grown into one of the premier journalism organizations of the world with thousands of members and activities to promote freedom of the press. Dedicated to the journalists who devote and risk their lives to edifying the public, exposing truth and defending free speech. Dedicated to the reservists of the uniformed services of the United States on the 22 of October 1997. 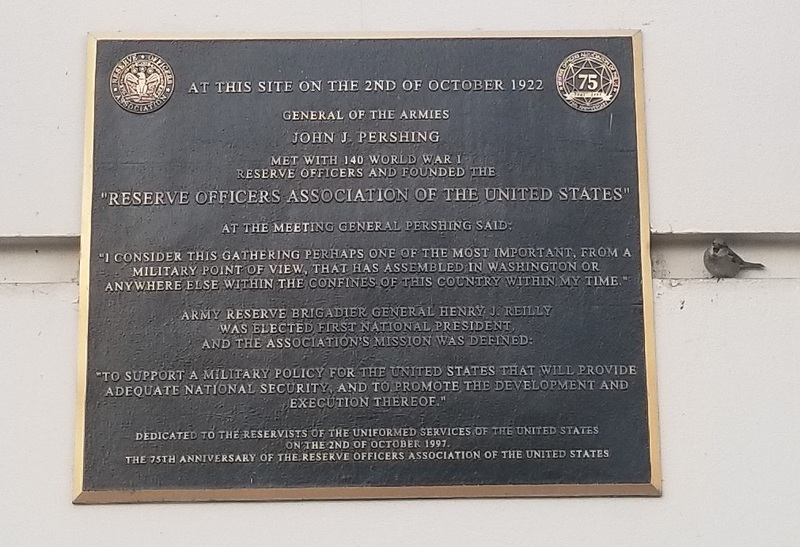 The 75 Anniversary of the Reserve Offices Association of the United States. In a time of racial strife he brought reconciliation and mutual respect. In the struggle between management and labor he worked for reason and moderation. 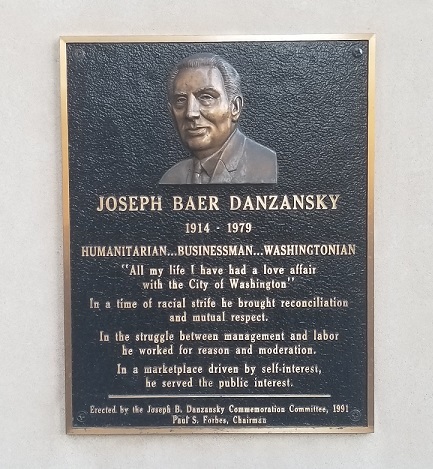 In a marketplace driven by self-interest, he served the public interest.